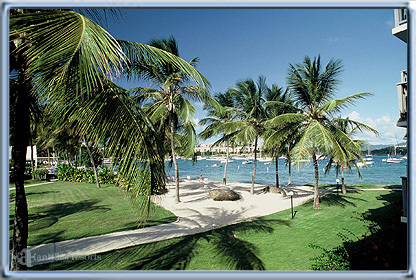 From the Bay to St Maarten RYM clients had a great March! The following is from Latitude 38 – San Francisco’s best sailing magazine.. 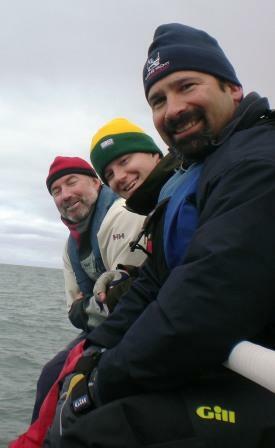 In the 23-boat J/105 fleet, Adam Spiegel’s Jam Session played the tune of a consistent 1-1-3 to finish six points clear of the runner-up, Scooter Simmons’ Blackhawk. But while the Jam Session crew of Dave Kelly on bow, Geoff Papilion trimming, Guillemette Brouillat Spiegel in the pit, Jim Barkow on strategy and Ken Turnbull on main and tactics — may have won going away, they almost didn’t make it to the start of the first race after their collision at the Big Daddy Regatta a week before. “It was only due to a bunch of hard work by our rigger, Ashley Perrin, that we got the boat back together,” Spiegel said. If we were to win our class at Rolex Big Boat Series, we’d probably celebrate by hitting up the Marina district’s watering holes. When Barry Lewis and his gang on Chance took the J/120 title last year, he decided to go sailing. But instead of taking a victory lap around St. Francis, Lewis opted for a decidedly warmer venue — St. Maarten and the 2009 Heineken regatta. “After a few years of losing out at Big Boat Series in the final seconds of the last race, or on a count-back, we had the motive to celebrate,” Lewis said. 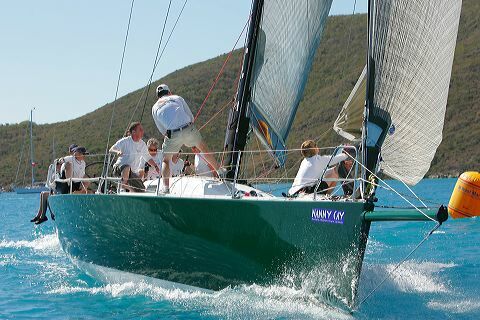 “The Heineken Regatta was our opportunity.” Two years ago, Lewis had the chance to sail on Royal Ocean Racing Club Commodore David Aisher’s Rogers 46 Yeoman XXXII at the BVI Spring Regatta. When he found out from the boat’s captain, the Bay Area-based Ashley Perrin, that it was available for charter for the Heineken regatta, he jumped at the opportunity, to sail the all-carbon speedster. Lewis decided to recruit crew for the event from within the Chance family. In addition to Perrin, he brought along his son Blake to grind, tactician Doug Nugent, main trimmer Aaron Elder, trimmers Matt Gingo and Michael Redmond, David Krause on the bow and Bryan Murdoch, Seamus Wilmot, Sean Ross, and Mark Ruppert who filled in between. The only non-regular was Lu Ann Bell, who usually races on the competition — John Wimer’s Desdemona — back home. 11:30pm last night I was on my back under the bulb of Yeoman with a long board sanding down the fairing job after a very long day. Up early to load the boat and leave by 8:30 from St Thomas. 3 hour transit to Nanny Cay Marina where we unloaded at the dock and cleaned the boat inside cleared customs and immigration registered to race and moved to the haul out slip all by 1:30pm. Getting into the haul out requires everyone out on the end of the boom and a rib to haul us over with the halyard. Once we are past C dock we then have to moved a powerboat off the dock and walk ourselves along the dock, we then have a foot and half of water under us to get to the haul out slip. By 4pm we had undone the bolts holding the bulb on the fin and had the keel off checked for damage and then rebedded the bolts and tightened the nuts back on. We needed some expanding foam to put around the nuts so that we could then fair over the bolts. Finding a can of spray foam was not possible so we ended up with a two pack solution which was messy to say the least! Some grinding and two fills later it was time to leave for dinner and let the epoxy harden. Then back for some fun on my back with a longboard and a quick paint with the 545 primer before putting her back in the water in time for racing this morning. I am now in Leverick Bay after an upwind slog in the rain but the location is worth it – we are at the poorer mans Bitter End. I was even able to have an afternoon nap as I had a storming headache. Time for bed and up again early for a race around Virgin Gorda. 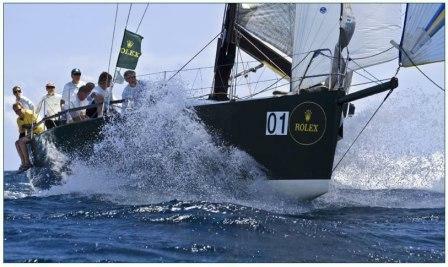 Rolex is over and we are moving onto BVI tomorrow with a large job list. Again the conditions were beautiful and challenging. Within one short leg there were three different ”races”. We were consistently in 4th so unsurprisingly ended up in 4th. As an aside I just learned while typing this post that my mid bow in the below picture who is a Sergent in the RAF regiment sailed around Cape Horn 8 years ago. Pretty cool. No breakages today but the results weren’t what we hoped for. On the positive side it was blowing 15-22knots pretty flat water and it was 80F. I was still feeling like a truck ran over me and lost my voice which amused everyone. Photo by Ingrid Abery the Rolex photographer. Tonight I made Chilean Sea Bass cooked with parsley, asparagus, olive oil, lemon juice, scallions, tarragon and white wine in parchmont paper. Served it on a bed of rice with a feta, tomatoe and red onion salad. Dessert was just chocolate ice cream. The guys have gone off partying and I had a great time talking to my nephew on skype and watching him on the video dancing around the living room. Bed time for me as I am up at 7:30am to dive the bottom of the boat before racing. Today dawned with me being sick. I have had a cold this whole week but I was physically sick – not something you want to know about. The RAF regiment boys who are racing on the boat tried to be helpful and fed me diralyte which worked the opposite of how it is meant to due to my reaction to it! I think it is child abuse to be giving that to kids it really is rank. I basically crawled down to the boat and announced I wasn’t going to be cleaning it everyone was sympathetic and offered various potions and pills. The first race we were 30 seconds late to the line – not a great start. We managed to kill the A2 in the first drop and then proceeded around the top mark where we hit a rock which wasn’t charted – hard. On monday we will hoist out to repair the damage. However, we ended up 2nd in the race. Seeing as I was not feeling flash Ian jumped over the side to survey the damage to the keel bulb. I called to organise a lift out at a marina in Charlotte Amolie but it was decided that we could continue racing. The second race we were again late across the start line. It was a long race 23 miles race with lots of sail changes the TP52 and the Cookson were able to stretch their legs on the course and we ended up with a 4th. Putting us in 3rd overall after the first two races out of 5. So quite a bit of boat damage to repair….. I am on Yeoman XXXII again as boat captain and it should be a fun three days of racing. I will try to keep the site updated. The guys on the rail…. 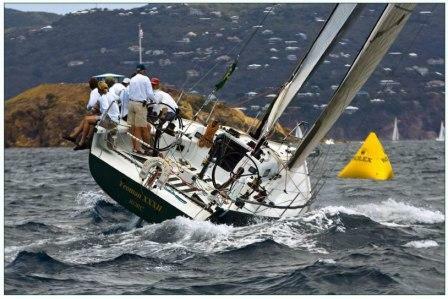 I jumped on the Quest 33 for the lightship race on Saturday before heading for the red eye to take me back to Yeoman in St Maarten. Wayne the owner wrote about the race. It started in light air that got lighter right next to the mark so we carried our number one. Then a front came through and the sunny blue skies went away with gusts up to 26 knots making the downwind a fun affair. We ended up peeling the kite but as we only have one spin halyard this involved jib up and kite down and then kite up and jib down. It was a fun race all in all. hold on to the boat steering by Ashley) more than made up for the ebb. I drove up HW 1 on Monday after a day in Monterey doing Divemaster exams. It really is very beautiful – I guess sometimes I forgot how beautiful it is right outside my front door! 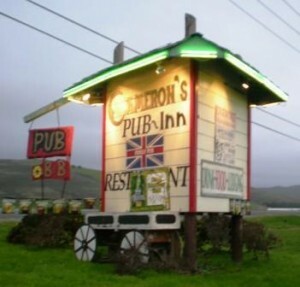 I stopped to have dinner with some friends at a British Pub in Half Moon Bay with a double decker bus and London taxis outside. All good fun. I raced on the Quest 33 at the Big Daddy regatta out of Richmond YC at the weekend. It was a shock to the system as the temperature was a ‘touch’ lower than St Maarten! 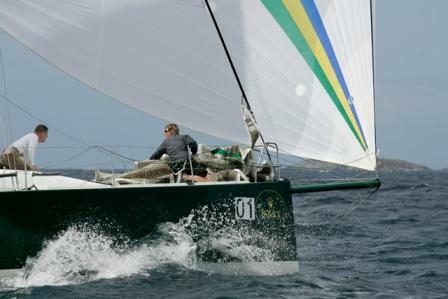 We had three inshore windward leewards on the saturday and a pursuit race on the sunday. The Quest 33 is a hard boat to sail inshore as it really isn’t set up for 1 mile windward leewards. We had a new crew onboard who was learning the ropes and did a good job of it. We also had Rob who is living in Idaho who was very excited about not being in the frozen tundra for the weekend. The results were mid fleet and we only blew up a clutch. The wind steadily rose to the low 20s and we were down to the number 3 by the end of the day. I always enjoy the pursuit races the most. The course is RYC alcatraz, angel back to RYC in either direction. We went the opposite way to 80% of the fleet. There was a lift on the way to alcatraz and although we got passed by a few of the big boats coming from the other direction in the last 1/2 mile I think it was the right way to go for sure. I rushed off after racing on Sunday to go and look in on a boat that had a large collision on Saturday and needs to be put back together for this coming weekend. It never stops in my business! On Monday after the regatta I took Yeoman round to Bobby’s Marina at the airport location. It was so much less stressful than two years ago as they have now marked the channel which is a large benefit when you draw 10 feet and can’t touch bottom with a delicate carbon boat! Simpson Bay Marina kindly lent me a RIB driver to push my bow through the wind to get into the tight haul out which has a wreck on one side and a shoal on the other. Lance who runs the boatyard was on the ball and we were hoisted out within 30 minutes of getting there and an hour or so later a pit had been dug for the keel and Yeoman was all dug in for 14 days. To say that Lance has a soft spot for dogs and cats is and understatement! The animals that he brings in from the streets are lucky indeed getting fed, watered, taken to the vet and cleaned. They are all well mannered and not at all aggressive all they want are lots of petting! Lance spends 50% of his income on his animals they are his family which as he says means that he is not likely to move anywhere. If he does go back to his native South Africa it will mean getting a container and converting it into a dog/cat transport facility. The two dogs I remember from last time I was here two years ago have unfortunately passed on and taking their place are a brother and sister. These puppies are easily spooked but are thriving on the attention and growing fast. Lance dropped me off at the airport at 5:45am including me in his dog feeding run – every other day he takes food to a large pack of dogs behind the movie theater and another pack next to the airport. I asked if he takes donations towards feeding the dogs and cats, he doesn’t – as he says money comes and goes it doesn’t make you happy in the bank. Yeoman has a bunch of repairs to be done while I am away so she is in a bit of upheaval with floorboards out etc. I return in 9 days it will be a quick turn around and off to St Thomas and the BVI for some more racing in the sun. Hopefully my long commute home to the bay will go smoothly and I will be hanging out with my nieces in the morning. Little Charlotte should be out of the hospital after surgery apparently her scar is 3 inches long which is half the length of her torso.